Incorporating modern ideas, methods, and philosophies of quality management, Fundamentals of Quality Control and Improvement, Third Edition presents a quantitative approach to management-oriented techniques and enforces the integration of statistical concepts into quality assurance methods. Utilizing a sound theoretical foundation and illustrating procedural techniques through real-world examples, this timely new edition bridges the gap between statistical quality control and quality management. The book promotes a unique "do it right the first time" approach and focuses on the use of experimental design concepts as well as the Taguchi method for creating product/process designs that successfully incorporate customer needs, improve lead time, and reduce costs. Further management-oriented topics of discussion include total quality management; quality function deployment; activity-basedcosting; balanced scorecard; benchmarking; failure mode and effects criticality analysis; quality auditing; vendor selection and certification; and the Six Sigma quality philosophy. 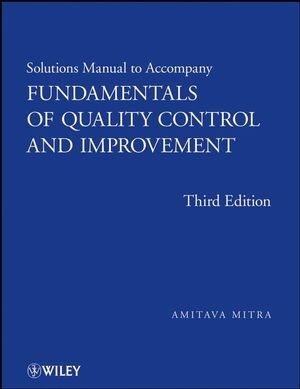 Amitava Mitra is the author of Solutions Manual to accompany Fundamentals of Quality Control and Improvement, 3rd Edition, published by Wiley.